The US Environmental Protection Agency (EPA) on April 4, 2018, announced the availability of funding that could provide as much as $5.5 billion in loans, which could leverage over $11 billion in water infrastructure projects through the Water Infrastructure Finance and Innovation Act (WIFIA) program. Prospective borrowers seeking WIFIA credit assistance must submit a letter of interest (LOI) by July 6, 2018. The WIFIA program received $63 million in funding in the 2018 budget bill, signed into law in March 2018. This more than doubles the program’s funding from 2017 where 12 projects were selected from across the country supporting $5 billion in water infrastructure. https://www.epa.gov/sites/production/files/2017-07/documents/fy17-wifia-selectionoverviewfactsheetv2.pdf Leveraging private capital and other funding sources, these projects will create more than 170,000 jobs. • Drought prevention, reduction, or mitigation projects. Congress and the US Army Corps of Engineers have opened the opportunity for the public (non-federal interests) to propose new water resource projects or modifications to authorized water resource projects. Section 7001 of Water Resources Reform and Development Act (WRRDA) 2014 requires that the Secretary of the Army submit to the Congress a report annually that includes feasibility studies submitted by non-federal interests and proposed modifications to an authorized water resources project. This annual report to Congress on Future Water Resources Development, prepared by the US Army Corps of Engineers (Corps), becomes the basis for projects to be authorized through future Water Resources Development Acts (WRDAs). The 2018 runoff forecast in the Missouri River Basin above Sioux City, Iowa, is 33.0 million-acre feet (MAF), 130 percent of normal according to the US Army Corps of Engineers Missouri River Water Management Division. Based on the current plains and mountain snowpack, runoff into the Fort Peck and Garrison reservoirs is expected to be above average from March through July. As of March 1, the Corps reported the mountain snowpack was 139-140 percent of average in the reaches above Fort Peck and from Fort Peck to Garrison. Normally the mountain snowpack peaks in mid-April. Plains snowpack is currently heaviest in central and eastern Montana. All 2017 stored flood waters were evacuated from the Missouri River mainstem reservoir system (System) as of January 15, when the total volume stored in the System reached 56.1 MAF; the bottom of the Flood Control & Multipurpose pool. System storage is currently 59.1 MAF, occupying 3.0 MAF of the 16.3 MAF flood control zone. System flood storage is reported to be currently available to capture runoff from the plains snowpack, spring rainfall and runoff from the mountain snowmelt. · LBB, LLC near Topeka, Kansas. Commercial dredging for sand and other aggregate materials from the Kansas River has taken place over the past 100 years. Since 1990 total extraction permit limits have ranged from a high of 4.7 million tons, to more recently, a 2.2-million-ton annual limit; however, actual dredging has ranged between 88% and 23% of the annual limit. Total extraction under the proposed permits, as in the past, is dependent upon aggregate supply, demand, and other market driven factors, as well as, existing river conditions. During the five-year permitting period, the river bed will be monitored every two years with the data to be used in the reevaluation of the issuance of any future commercial dredging permits. With the 2018 budget bill signed by President Trump on 23 March, funding for water resource projects across the nation move from under the restrictions of the Continuing Resolution to a full budget for the remainder of fiscal year 2018. The government has been operating on a series of continuing resolutions since October, and this agreement removes the uncertainty that arises from those short-term measures. The 2018 budget provided the US Army Corps of Engineers civil works program funding of $6.8 billion, an increase of $789 million from the FY17 levels. The bill also continues the prohibition on the implementation of the final Principles and Requirements, directing the Corps to continue to use the 1983 Principles and Guidelines. Partnerships to invest in flood protection within the Kansas City metropolitan area continue to move forward! The final phase of the flood control project to further reduce flood risk in the Blue River Basin – Dodson Industrial District has been initiated. 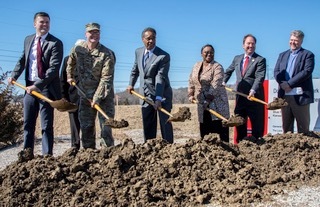 The kickoff of the final phase of the construction for the long awaited levee completion was celebrated by KCMO City officials, other dignitaries, and Congressman Cleaver on 2 March. The groundbreaking initiates the final phase of a five phase project and will result in a 500-year level of protection for the Dodson Industrial District. The industrial park located along the Blue River in the south–central portion of Kansas City, Missouri, has been subjected to repeatedly flooding from the Blue River resulting in damage to private businesses and public utilities, and risk to public safety. 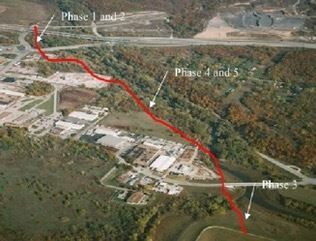 The final phase of the project is construction of nearly a mile of earthen levee that will connect existing upstream and downstream features into an integrated levee-flood wall system to provide reliable flood protection for the companies, service providers, and people within the Industrial District. Important to the metropolitan area, the Dodson Industrial District represents a property investment of nearly $380,000,000, made up of a public works facility and 30 commercial/light industrial firms, employing 1,500 people. Construction was initiated in 2003 with the final phase currently underway being completed in 2020. The final phase of the project is being funded by revenue from the GO KC bonds totaling more than $7.5 million plus $17 million from the federal government. The funding participation and completion of the project represents thecontinued success of partnerships with area industrial and river associations, the City of Kansas City, Missouri, Congressional offices, and the US Army Corps of Engineers in addressing long term flood control needs for the Kansas City region. Representatives from MOARC and KCIC conducted their spring congressional visit on 5-8 March to inform and educate the Missouri and Kansas congressional delegation on the successful completion of several flood risk management projects and those MOARC and KCIC are fighting to finish. MOARC and KCIC provided a unique perspective with 16 representatives from the Kansas City metro city governments, regional businesses, industrial councils. We were able to meet with 14 House and Senate congressional offices, the majority and minority authorization and appropriations committees, OMB, FEMA, the Assistant Secretary of the Army for Civil Works (ASA-CW) and the Corps of Engineers over the four days of visits. The diversity of stakeholders within MOARC and KCIC supporting and advocating for improved flood protection to support continued economic development in the Kansas City region continues to impress the congressional delegation, appropriations committees, and the Corps of Engineers. The visit emphasized stakeholder interest and participation in projects. The on-going partnerships with the Corps of Engineers, congressional offices, and local sponsors of projects have successfully completed major portions of projects or secured funding to complete projects across the Missouri and Kanas region. Projects completed or funded to completion include Turkey Creek Basin, Blue River Basin (Dotson Industrial District), St. Joseph Levees and Topeka Levees. Projects needing design or construction funding to continue forward toward completion include Kansas Citys Levees, Swope Park Industrial Area, Manhattan Levees, and the Upper Turkey Creek flood control project. MOARC followed up the visits by submitting appropriations requests to the congressional offices to complete design and construction of on-going flood protection projects and request language for New Start projects within Kansas and Missouri. Last month the US Army Corps of Engineers (USACE) held their Annual Navigators Meeting at the National Weather Service Training Center in Kansas City. The meeting brings USACE, the US Coast Guard (USCG), representatives of the navigation industry and Missouri River stakeholder businesses together to discuss the status of navigation and opportunities in the upcoming navigation season. The meeting was the best attended meeting in the last five years! Industry stakeholders reviewed navigation and commerce in 2017 and gave their predictions on 2018. In 2017 from Omaha, NE to Lexington, MO approximately 250K ton of freight moved (excluding sand & gravel). In 2015 only approximately 70K tons was transported. This shows the river’s resilience and reliability to support waterborne commerce. USACE and USCG gave reports on their respective areas of operation and USACE focused on the reservoirs and expected precipitation for 2018. With plains and mountain snowpack at above average conditions full support for navigation is expected for this year. Overall there is great interest in navigation for the Missouri River with additional national barge lines expressing interest in supporting shippers in Missouri and neighboring states. SAVE THE DATE for the MOARC/KCIC Spring Trip to DC, March 5 – 8, 2018! MOARC and KCIC representatives will be making visits to Agency and Congressional offices Monday, March 5th through Thursday, March 8th , as well as, attend the 2018 National Waterways Conference. Those wishing to can register to attend the National Waterways Conference's Legislative Summit being held in Washington DC 5-7 March (Committee meetings are on Monday with informative general sessions on Tuesday and Wednesday mornings). The annual legislative summit hosted by the National Waterways Conference will focus on the water resource infrastructure development to support the nation’s waterways and the economic development through strong, secure, sustainable waterways across the nation. As Congress returns for the second session of the 115th Congress, high on the national agenda is the development of a Water Resource Development Act (WRDA). A 2018 WRDA would authorize a variety of water resource projects across the nation supporting flood control and waterways infrastructure. Additionally Congress has pledged to move a comprehensive infrastructure package in 2018. The Legislative Summit provides a great venue for the water resource industry to hear from high-ranking Congressional and Executive branch officials and industry leaders about water resources policy developments and program expectations for the coming year. MOARC and KCIC representatives can participate in the Legislative Summit in concert with the MOARC/KCIC Spring Congressional Visit. We will have opportunity to hear of the Administration and Congress’ plans for investment in waterways infrastructure and authorization plans for new water resource projects. The conference provides opportunities to network with principle congressional offices and water resource agencies (i.e. US Army Corps of Engineers, House Transportation and Infrastructure Committee, President’s Council for Environmental Quality) during the conference and at the Congressional Reception co-hosted by the Mississippi Valley Flood Control Association. The Legislative Summit will be held at The Madison Hotel in Washington, 1177 NW 15th Street, near the Capital on 5-7 March. Registration is underway and can be found on the National Waterways Conference website www.waterways.org. Hotel information can also be found on the website. MOARC members interested in attending the summit are encouraged to register soon, and please let us know.